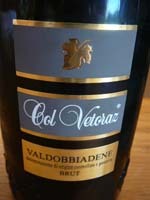 This prosecco brut from the Col Vetoraz winery is an Italian white sparkling wine produced in the Valdobbiadene hills. My tasting notes say that it has a nice pale yellow color with small bubbles. The nose is fresh with fruity (pear, citrus) and white flowers’ aromas initially and then progressing to chestnut. It offers a medium-bodied elegant and crisp mouth with a lasting finish.